I have always hated the gym with a real passion but recently I have got into the swing of it and have actually enjoyed attending my different weekly classes. However, I am always filled with envy when I see everyone's lovely bright gym clothes when I am standing in an old t-shirt that I should have thrown out years ago. In an effort to keep my gym attendance up I decided to invest in some new gym gear so I would be more tempted to go. I have recently invested in some Nike Free Runs which I absolutely love as my previous pair had no grip across the bottom which made lunges and workouts rather precarious! I love these Nike trainers as I can wear them both socially and at the gym plus they are unbelievably comfortable and very lightweight. Fabletics is a company that was co-founded by Kate Hudson and sells really good quality but affordable gym wear. The website is easy to use and they even put outfits together for you depending on if you prefer running outdoors, the gym, yoga or a bit of everything. But the best thing has to be the offer when you first sign up as you get an whopping 50% off making it the most fashionable but affordable range of gym wear. I love wearing my kit now and it has definitely inspired me when I go to the gym. 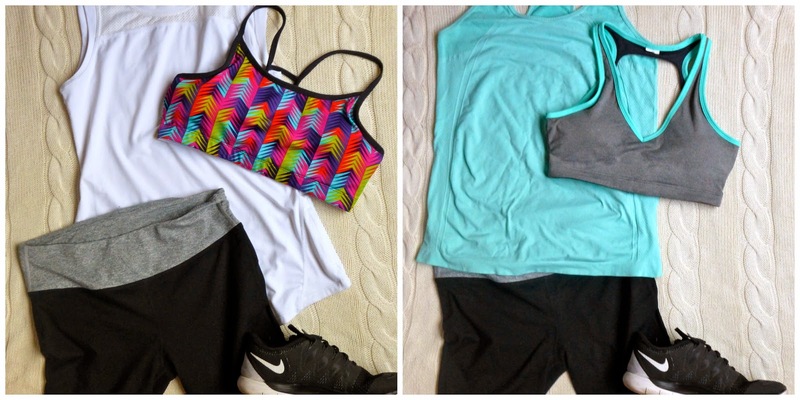 Above are the two outfits I bought and since wearing them I have had people at the gym ask me where I got them from. If you want to feel inspired by your gym kit then I would definitely recommend looking into this amazing offer. 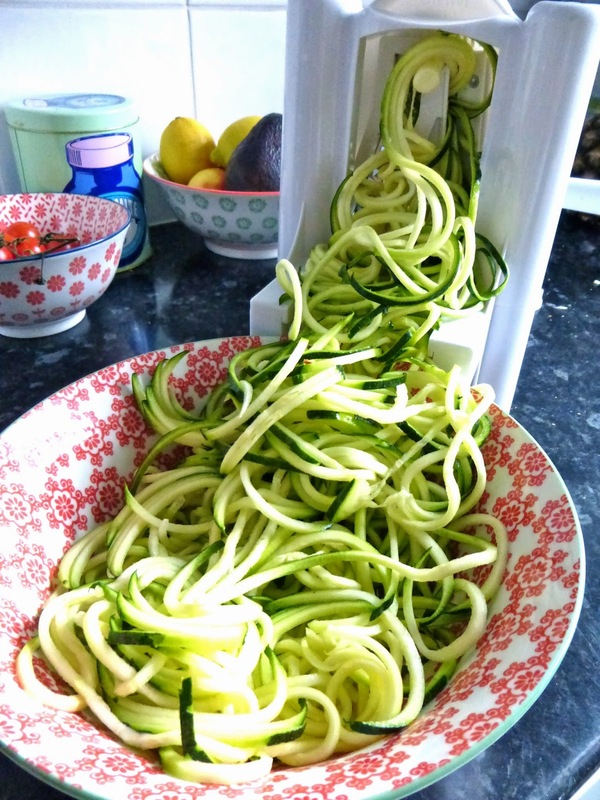 Spiralizer - Perfect for those who want to eat more vegetables! I bought a spiralizer after constantly lusting over Bex's lunch at work, her blog Twins in Trainers is amazing and you should definitely check it out! She got me hooked onto Deliciously Ella's website and as most of her recipes have 'Courghetti' I knew I would have to give it a go. When the spiralizer arrived my boyfriend rolled his eyes, dismissing it as a waste of money and another one of my fads that would be loved and then quickly forgotten about. He also pointed out I could just use a peeler and then finely slice the courgettes to achieve the same thing. I decided to ignore the former comment and it has now been about 7 months and my love for it is still going strong! I am not going to lie, it is a bit of a faff to create and wash up but I do think that extra bit of time is worth it. I am becoming addicted to eating lots of vegetables and I try to avoid pasta as it leaves me feeling very bloated. The contraption comes with different graters that you can change depending on what you would like your vegetable to be turned into. Whether it is sweet potato chips, curly fries, elaborate decorations or noodles. You then slice the vegetable into a sizeable chunk, place it between the two skewers and then turn the handle. It really is very easy to create and the pieces effortlessly dismantled for cleaning. I think that courgettes have to be my favourite vegetable to spiralize and I like to gently sauté them so they have a similar texture to spaghetti. However I would like to point out that there is a high water content in courgettes so do not put your sauce in until after you have cooked them and drained the excess otherwise you end up with a very soggy watery dinner! Above I spiralled one courgette, chopped the courgetti into smaller strands and then gently cooked them with my homemade pesto sauce, tomatoes and fresh basil leaves. It was incredibly delicious, healthy and kept me full until morning! If you would like I can post some of my other much loved recipes here too. You can buy a Spiralizer on Amazon for about £28. This week has been a scorcher in London so I made the most of sunbathing either in London's beautiful parks, such as Green Park and St James', or sunning myself at Brockwell Lido. On Tuesday I met up with Jude and Selina and we shopped down Oxford Street where I bought some beautiful bikinis from Victoria's Secret. We then spent the afternoon sunning ourselves before walking through the parks home. The girls made sure we swung by Buckingham Palace as they couldn't believe that I had never seen it before! We also made sure we stopped off at the very lovely The Thomas Cubitt in Belgravia for a glass or two of wine, if you are in the area I would definitely stop here as the food looked incredible too! Wednesday and Thursday were spent at one of London's outdoor swimming pools: Brockwell Lido, with Selina and Kat. Although busy we managed to secure a spot for ourselves and the cool water ensured we never got too uncomfortable in the blazing sunshine. On Wednesday evening Selina and I relaxed on her balcony with wine and popcorn before heading to a friends for a lovely BBQ. On Friday I met my parents at the Royal Academy to see the Summer Exhibition again and the Dennis Hopper: The Lost Album Exhibition. Both of which were excellent and well worth the trip. We then met my boyfriend and tried Vinoteca as I have only been once before and the staff we so lovely I have always wanted to go back. Vinoteca Soho is an excellent wine bar that also serves delicious food for an affordable price. The staff definitely know there stuff when it comes to the wine and are eager to help you with you selections. We were all so impressed with out food and I will definitely be heading back there soon. This weekend my brother Bill came home and we celebrated his new job with delicious food and wine. It was another excellent week although now the weather is starting to cool I am not sure how long my lovely new tan will last! 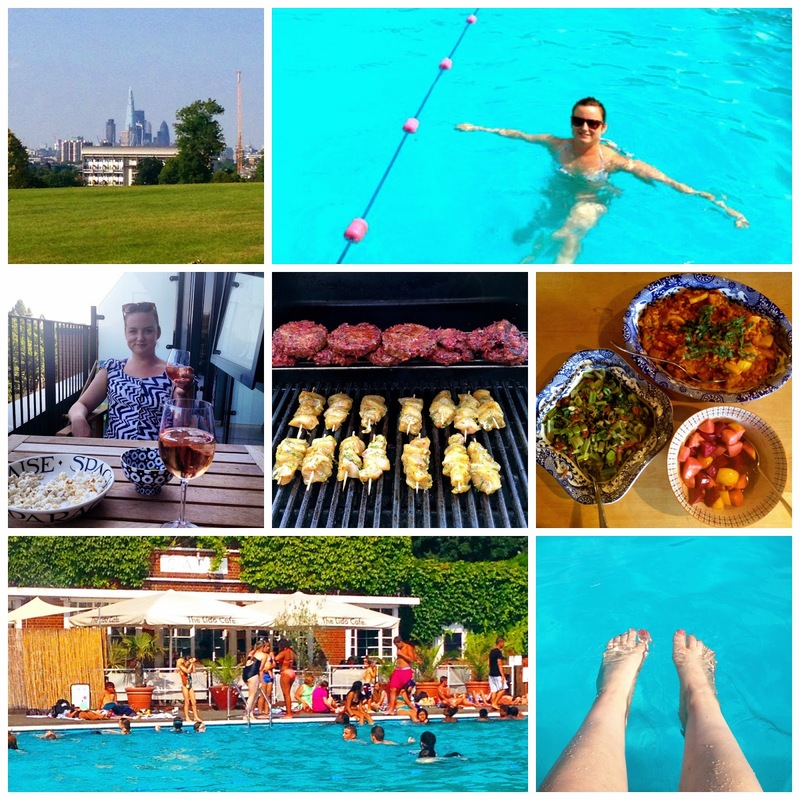 Photographs: View of London from Brockwell Park // Cooling off // Wine on the balcony // BBQ Time // Brockwell Lido. 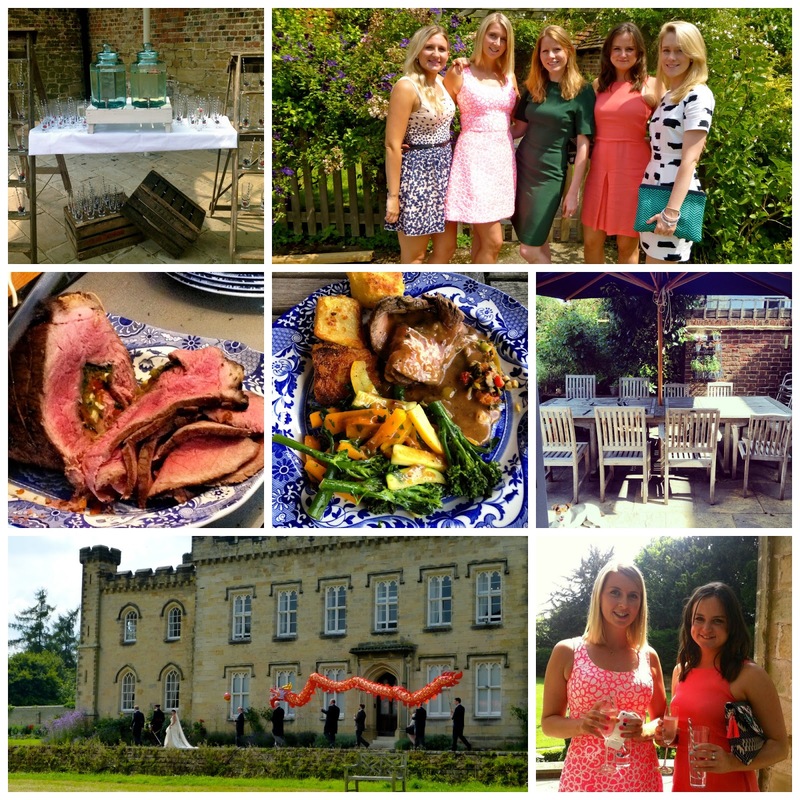 Favourite post: If you have been reading these weekly posts then you will know I have finally got the whole gym thing! 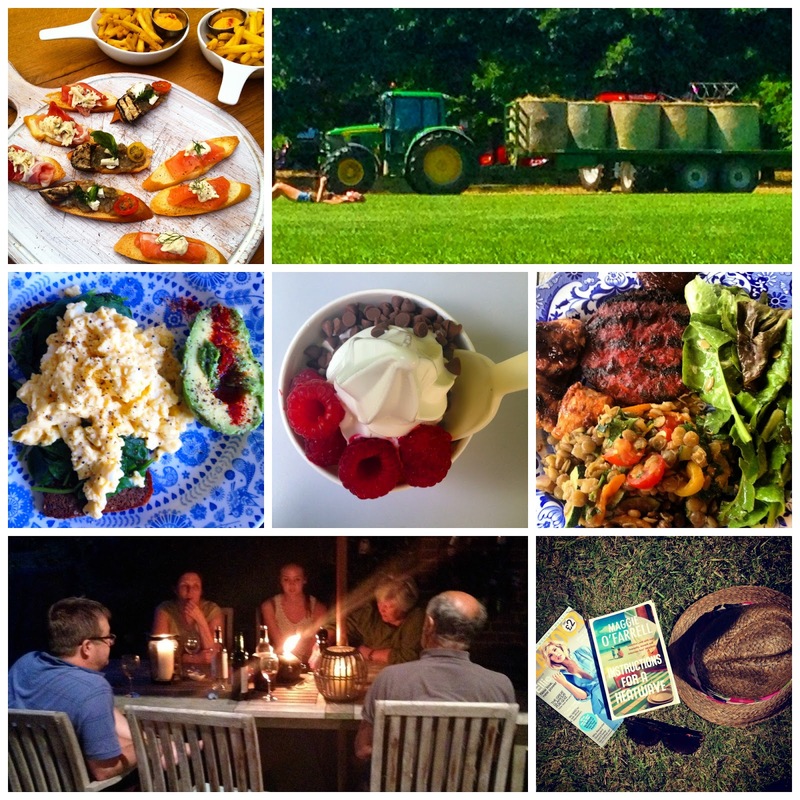 Unfortunately as I am on holiday for most of August I have frozen it for a month but for this week I have found the blog Em Talks really inspirational for food and fitness tips. She has a gorgeous figure and gives very honest and helpful tips. She also does lots of fashion and beauty so definitely check her blog out! There are so many different hair oils now but the Charles Worthington Strength & Repair Miracle Repair Elixir Hair Oil (a terrible mouthful I know!) has to be my absolute favourite and I am now on my third bottle of the stuff! I am lucky that my hair is naturally straight and extremely stubborn when I attempt to curl or style it in any way so I actually use a limited amount of heat on it; especially now the weather is warmer I try to let it dry naturally as often as possible. However at times I feel it can lack the hydration and softness I crave and that is when this serum/oil comes into play. There are the many ways this multi-purpose product can be used: as a heat protectant; a mask before shampooing; to ease de-tangling on damp hair; reduce frizz; strengthen each hair from within; smooth and increase shine. It can be used on damp and dry hair but I much prefer the former as it can make my dry hair look too lank. The blend of five natural oils nourish and repair your hair but do not leave it feeling greasy. In fact the light weight formula absorbs quickly and leaves your hair with a silky soft feeling and a healthy look - but you only need the smallest amount! Although it does include natural oils and plant extracts it also contains silicone which might put some people off. At £15 (although it is currently £10 in Boots) it is not the cheapest hair oil available but I always stock up when there are offers and one bottle will last me months and months as a little really does go a long way! What is your favourite hair oil? N.B The artwork in the photos are from the very talented Anna Wright. Her work is amazing and well worth checking out if you love animals! I have been either juicing or blending fruit and vegetables for over 4 months now and I can definitely see the benefits. My skin is much clearer, hair shinier, my body slimmer and I just feel a lot healthier. Breakfast for me is the worst meal of the day, unless of course we are talking about brunch. I am not a fan of cereal as I do not have a sweet tooth and I find granola too similar to horse feed! The other options normally involve toast or pastry neither of which are very good for you. I always try to eat a varied healthy diet and normally succeed with lunch and dinner but for me breakfast always seemed like a wasted meal until I started having smoothies or juices in January and the obsession has grown! I am going to go into juicing more next week but for now I thought I would share one of my favourite smoothie recipes with you. * I buy my blueberries then freeze them. I normally tip half a tub into this blender and this keeps it nice a cool! I would show you a picture of finished drink but mine never turn out looking nice, unlike DelciouslyElla - hers always look amazing! What smoothies do you enjoy? Tresemme Instant Voluminsing Refresh Dy Shampoo - Perfect for Brunettes! I was always envious of my blonde friends who could use dry shampoo without a care in the world. In fact many use it now to not only give their locks volume and texture but also to lighten it before nights out. I was never a huge fan of dry shampoo after one to many times of leaving the house to only realise a few hours later that I had zebra stripes running through my hair or that my scalp looked like it had aged 50 years. With my Batiste I tried everything from frantic rubbing for ages, to using the hair dryer but I always worried that there would be a noticeable patch that would suddenly become painstakingly obvious in the bright sunshine. That was however until I found the Tresemme Instant Volumising Refresh Dry Shampoo. I am sceptical of dry shampoos that claim to counter for brunettes as found the Batiste version was no better than the others but this formula works. I never have to worry about grey patches or streaks as it becomes unnoticeable once massaged into the hair. Instead you are left with fresh looking locks without the hassle and bother of actually washing it. This version also gives my limp locks some much needed volume that lasts a surprisingly long time. I absolutely love this and have gone through countless bottles of the stuff. I also have a mini version in my gym bag for when I am in rush - gross I know! What is your go-to dry shampoo? It has been a while since I did a peek into my everyday makeup so I thought I would give an update. Garnier Miracle Skin Cream - full review here. This is an amazing lightweight base that not only smooths and freshens but also contains SPF and other ingredients to combat signs of ageing and dark spots. To conceal I use a mixture of the much loved Laura Mercier Secret Camouflage (review here) which I mix (especially under the eyes after a late night) with my very battered L'Oreal highlighting concealer. I use the Real Techniques Dome Shadow Brush to blend and then the Detailer Brush to pin point any marks that are still on display. To contour my rather round cheeks I use the NARS Contouring Blush in Paloma (review here) and I sweep the beautiful Hourglass Ambient Blusher in Dim Infusion (review here) to add colour and highlight my cheekbones. Finally I will set everything in place, particularly around my eyes, with the gorgeous Ambient Lighting Powder in Dim Light (review here). All of these are applied with either the EcoTools Brush or the Bare Minerals Blush Brush. If I want a slightly defined eye then I use the Mac 217 and the NARS Contour Palatte to give a soft contour and some colour to my lips. Then I curl my eyelashes with the Japonesque Power Curlers, which are amazing (review here) and then I coat my lashes in the rather fabulous Bourjois One Second Mascara (review here). Although this does take longer than a second it gives dramatic results that last all day. I am even loving it more now it has slightly dried! If I am going to wear liner then I will add some Eyeko Skinny Liner which is a felt tip and so easy to apply (review here). For my brows I use the dream combination of Anastasia Brow Wizz and the Maybelline Brow Drama to ensure they remain defined all day (review here). These added extras are either in my makeup bag or just floating in the depths of my main bag - this is definitely noticeable with my Clarins Instant Light Perfecter as it is covered in red pen! I also love the Revlon Lip Butter in Berry Smoothie and the Clinique Chubby Balm in Whopping Watermelon as both give a very natural colour to the lips, are moisturising and can be applied on the go. 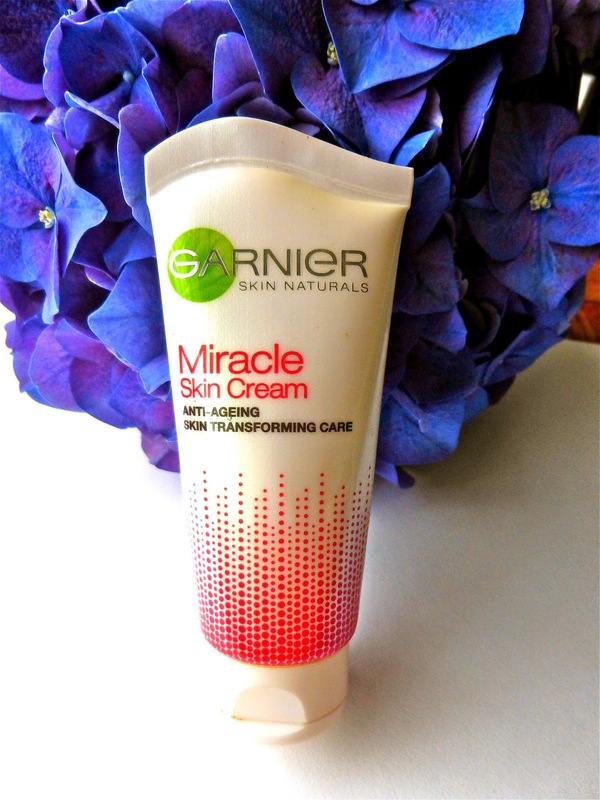 I have read lots of mixed reviews about this new Garnier Miracle Skin Cream however after seeing the beautiful finish on friends I decided to give it a whirl. It claims to instantly transform your skin leaving a glowing even finish whilst the seven anti-ageing ingredients (LHA, Peptides, Ginger, Pro-retinol and Vitamins C, B3 & B5) work on reducing the appearance of dark spots and wrinkles, as well as improving firmness and smoothness. This miracle cream claims to do so many things that I was convinced it could not live up to its name, however I have been pleasantly surprised at how much I love it! The consistency is like a moisturiser and comes out of the tube white but the colour adaptive microcapsules change colour on contact with the skin and adjust to suit your complexion and leaves a fresh, healthy, illuminating finish - which always seems an impossible task first thing in the morning! This is very lightweight and so does not offer much coverage. I would definitely liken it to the Origins VitaZing which I absolutely adore but with the Garnier you get much more value for money. I have been wearing this on its own most days as I love the natural finish it gives. It actually lasts surprisingly well and keeps my skin looking fresh and hydrated for the majority of the day. However, it also acts as a great glowing base for under foundation if you wish to have more coverage. It doesn't keep your makeup in place for longer or eradicate the appearance of pores but it does even out your skin tone and give it some radiance without interfering with the base you apply over the top. Another great thing about this product is that it also includes an SPF of 20 which I think is impressive and much needed on those no-makeup days. Although if I am planning on being in the sun all day I will choose a higher factor SPF like La Roche-Posay, read my reviews here. This product does have a very powerful scent to it and although it does not react with my sensitive skin my ultra delicate eyes do immediately water if I put the product too close or rub my eyes before it has set. The scent is not unlikeable and does fade once the product has been absorbed into your skin, however it does make me very wary of the sister Garnier Miracle Eye Product. I would definitely recommend this if you are looking for a light weight base in these warmer summer months. You can buy it in Boots for £12.99. What is your favourite summer base? Posts this week have included: Simple Kind to Eyes Nourishing Eye Make Up Remover. - One post this week is not very impressive! Favourite product: Since I bought the Bourjois 1 Second Volume Mascara I have not reached for anything else and especially now it has slightly dried out I have to say it might be my favourite eye product ever. Bold statement indeed! Read my full review here. I have repurchased the Simple Kind to Eyes Nourishing Eye Makeup Remover Cream so many times I have lost count! I am a huge lover of waterproof mascara as it helps keep my stubborn eyelashes curled all day and I have the most sensitive eyes which water countless times an hour Therefore unless I want a grungy/panda look I need to ensure that my mascara will not budge. Lots of people are worried to use waterproof mascara as they fret about removing it and pulling out their lashes in the process. I love this product as the creamy consistency feels nourishing against the thin skin that surrounds your eyes and it removes the mascara without any intense rubbing or removal of lashes. Instead the mascara melts away easily leaving my skin ready for my cleanser - I am currently using the Cetaphil one and loving it if you are interested! I squeeze a small amount onto a cotton and then gently massage against my lashes. It is not as quick as some of the high end alternatives but for the affordable price of £3.75 I do not think it can be beaten. Simple are a brand that I am sure everyone has tried in their teenage years but then quickly gets forgotten in favour for the more high end products but this make-up remover is an absolute gem in the range. It is quick affordable and it does not affect my incredibly sensitive eyes. If you are looking for an area to save in your skin care routine then I would definitely recommend giving this a whirl! You can buy it from Boots for £3.75. I feel the blog has been suffering a bit recently due to all the end of term events, new gym routine and busy weekends. I am hopeful that once the school year has ended I can really work hard on my blog and get back into scheduling posts and maybe update the layout. This week, like the last few, has been mostly taken up with the gym, school activities and dinner with friends. Wednesday we had a French breakfast where the boys brought in enough food to feed the whole school! Sports Day was on Thursday so I was lucky to enjoy the glorious sunshine and spent the afternoon browsing the shops on the Kings Road, lusting after everything in Anthropologie! This weekend I headed home for a big family BBQ as my sister is back from uni with her 2:1 and my youngest brother is off to South America and the Galapogos Island with school - ridiculous I know! I always enjoy coming home to Kent, especially to see all my family and eat delicious food. I am very lucky to have such a wonderful family that can get together as often as we do! 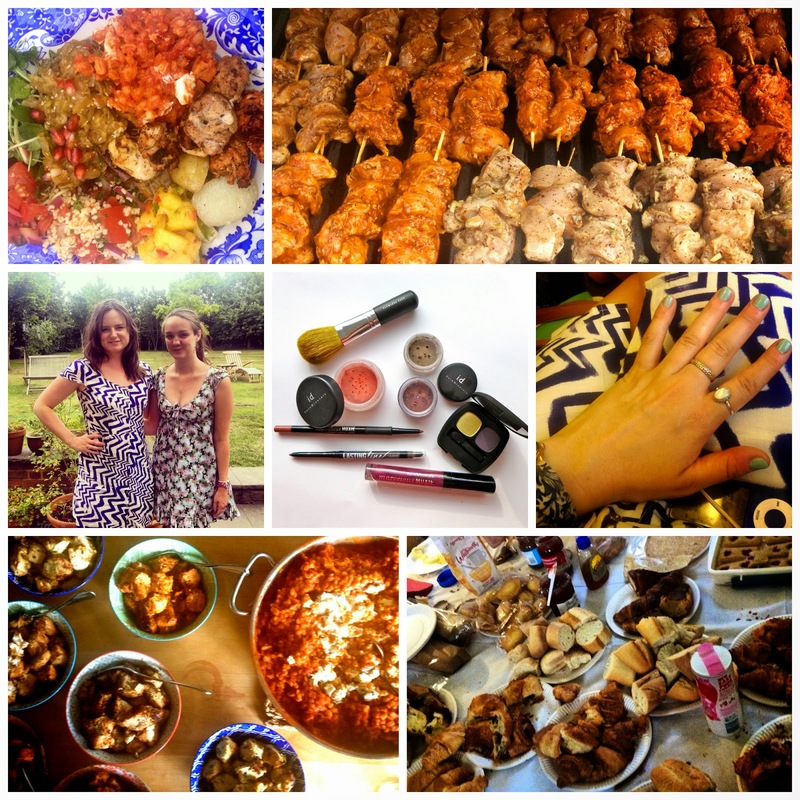 Photographs: BBQ Food // Chicken Skewers // My lovely sister & I // My boyfriend came back from a meeting with a gift bag from Bare Minerals! // Love this nail colour - L'Oreal Perle de Jade // More food // French Breakfast at school = too much food! 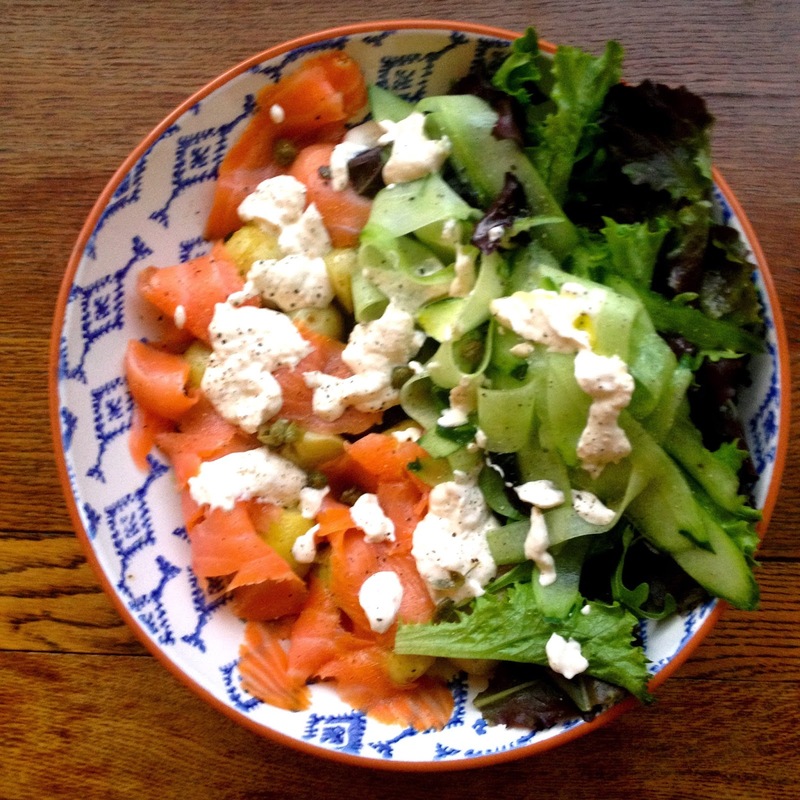 Posts this week have included: Smoked Salmon & New Potato Salad & The Summer Face: Cream Edition. Favourite post: Cannot believe I somehow missed this gem of a video over the last few weeks but I watched Caroline Hiron's Budget Skincare Video and furiously noted down all her recommendations! Favourite product: Since having my hair cut and getting a personal tutorial on how to keep curls in my stubborn hair my new favourite tool is the Enrapture Encode Totem Hair Styler, which I picked up from Amazon for an incredible £22! This is one of my favourite summer dishes and it is so quick and easy to make. It is based on the Jamie Oliver recipe here but slightly altered. Salad: leaves, tomatoes, cucumber etc..
1. Make sure your potatoes are a similar size and put them into boiling water until cooked through. I was always taught that things that grow below ground should be placed in cold water that is then boiled and vegetables that grow above ground are cooked in boiling water to begin with. New potatoes are the exception to this rule. Depending on size they should take around 15 to 20 minutes. 2. Grind the garlic in a pestle and mortar with salt and pepper, alternatively you can smoosh - technical term- with the side of your knife on a board until it is a paste. Zest half the lemon and then juice it into the mortar (or bowl), with the vinegar and add in the same amount of olive oil to mixture. Taste and adjust. 3. Mix with the capers (I always add loads more than as I love them!) and dressing with the warm new potatoes and toss together. 4. Zest and juice the remaining half of a lemon and mix with the horseradish, creme freche and dill. Taste and adjust. 5. Arrange the salmon, salad and potatoes onto a serving platter or plates and the spoon the horseradish dressing over the top. Voila - an easy simple dish that is delicious! Sometimes when the sun is shining I want to use hydrating cream based products to give my skin a really healthy glow. An SPF is a must for the Spring time and I love using this light weight La Roche Posay Anthelios XL 50+ as it sinks into the skin becoming undetectable, allowing your makeup to sit perfectly on top. Read more about it here. I have spoken about my favourite duo here, but adding the L'Oreal Lumi Magique Primer to my NARS Sheer Glow lightens the consistency of the foundation and helps give it that radiant finish. To conceal I have been reaching for this creamy Laura Mercier Secret Camouflage recently as it can double up under the eyes as well as over blemishes and is small so fits into my makeup bag perfectly. For the cheeks I opt for this Bourjois Bronzing Primer which I absolutely love in the summer time, when blended it is the perfect healthy tanned colour. Although it can be used as a primer I use it as a normal bronzer. To add a spring feel I put a light coat of either the Topshop Cream Blush in Flush or the Revlon Cream Blush in Coral. Both are absolute favourites of mine as they blend so beautifully. To add that glow to the cheekbones I always reach for my Benefit High Beam as the bronzed tone to it helps to give that spring or summer glow. Keeping to the cream theme I use the Maybelline Colour Tattoo in On and On Bronze. This is a cult product as an absolute favourite of mine. I will then go in with lashings of mascara. I love the L'Oreal Telescopic and the Bourjois One Second Volume, find out why here. I have been loving this Lord & Berry Lip Crayon in Cherry. It gives your look the perfect pop of bold colour and the creamy texture makes it the perfect hydrating lip. Read a full review here.